The United States Mint produced just over 3.57 billion coins for circulation in the first three months this year, marking their slowest first quarterly pace since 2014. 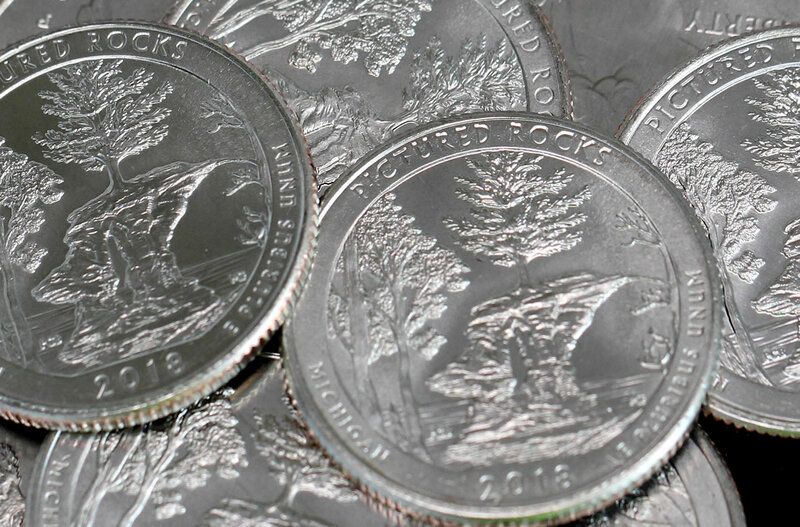 U.S. Mint data also offers mintages for Michigan’s Pictured Rocks National Lakeshore quarter, the first of five 2018-dated quarters with unique designs. 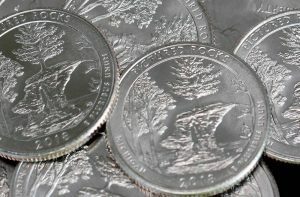 In the headline figure for March, coining presses struck cents, nickels, dimes, quarters, and half-dollars in amounts totaling 902.924 million coins. That’s 15.3% fewer than pressed in February and 37.6% less than those made in March 2017. The Federal Reserve always orders more 1-cent coins than any other denomination even as it costs the U.S. Mint 1.82 cents to make and distribute each one. The bureau struck 559.2 million Lincoln cents in March, representing 61.9% of the circulating-quality coins produced for the month. 9.3% for America the Beautiful quarter dollars. Native American $1 Coins and Kennedy half-dollars are no longer ordered by Federal Reserve Banks but they are still made in circulating-quality for coin collectors. In January, the U.S. Mint tends to strike both coins to the expected amounts needed for the entire year. That said, the agency in February did produce 1.8 million more 2018-D Kennedy half-dollars. Then in March, it struck 3.2 million more from Denver and 1.2 million more for Philadelphia. U.S. Mint facilities in Denver and Philadelphia manufacture all of America’s coins for commerce. Last month, the Philadelphia Mint struck 498.524 million coins and the Denver Mint made 404.4 million coins. In first quarter 2018, the Denver Mint made 1,703,720,000 coins and the Philadelphia Mint struck 1,867,254,000 coins for a combined 3,570,974,000 coins — 15.4% fewer than the 4,219,500,000 coins minted in first quarter 2017. The 2018 monthly average of about 1.19 billion coins tracks over 12 months to nearly 14.3 billion coins. Last year, the U.S. Mint produced over 14.8 billion coins for circulation — the third quickest for a year since 2001, after the more than 16 billion coins were made in 2017 and the over 17 billion coins were made in 2015. Pictured Rocks quarter mintages were reported for the first time, coming in at 182,600,000 from Denver and 186,714,000 from Philadelphia for a combined 369,314,000. These totals are nowhere near lows in the series. Finalized mintages for the newly released Apostle Islands quarter should be available by May or June. There are 124.4 million in quarters that the U.S. Mint hasn’t officially assigned to a design yet. These are a portion of the Apostle Islands quarters. Big jump in Kennedy half dollars from last year, more than double the *mintage, has not been that high of a total *P&*D mintage for some years now, *i wonder why the big increase. That makes total cents! Thanks Bob.